Iodinated contrast agents have been used for many decades and play an important part in diagnostic and interventional procedures. Contrast media are generally safe, but allergy-like reactions to contrast can potentially become life threatening. To prevent adverse consequences, careful review of the patient’s history for medical necessity of contrast agent is needed. This article describes the epidemiology and types of contrast reactions, factors associated with aderse reactions, premedication to prevent adverse reactions, contrast-induced acute kidney injury, contrast use among pregnant and breast-feeding patients, and contrast extravasation management. Iodinated contrast agents were developed in the 1920s.1,2 Starting as ionic, high osmolar contrast material (HOCM), contrast agents underwent further refinement during the 1960s with the introduction of nonionic compounds. Nonionic compounds do not dissociate in water; therefore, they are lower in osmolality. Low osmolar contrast media (LOCM) have undergone further evolution with increased hydroxyl groups replacing carboxyl groups for additional solubility in water. The lower osmolality and increased solubility in water lowers LOCM toxicity.2 Formerly used HOCMs have significantly higher incidence of adverse reactions compared to modern LOCMs.3,4,5 Usage of contrast materials has consequently increased exponentially as these agents have proven to be extremely safe with a low incidence of adverse reactions.1,6 Efforts aimed minimizing risks of contrast reactions are essential to providing high-quality healthcare. Anxiety has been shown to increase the likelihood of contrast reaction. Advising patients of the side effects they may experience may help to minimize anxiety, and thereby reduce the risk of adverse reaction.8,11 Administering anxiolytics before contrast injection to reduce contrast reaction is not routinely practiced. Table 1 outlines some considerations that should be taken in patients who report previous allergic reaction to IV contrast administration. A history of asthma has been thought to be a good predictor of increased risk; risk may be higher in patients with active asthma and/or bronchospasm. An inhaler should always be available when contrast media are being administered.21,22 Diabetic patients on metformin with normal renal function at baseline but with other comorbidities, such as liver or cardiac dysfunction, should stop metformin before receiving contrast and may resume 48 hrs afterwards if patient has no other intercurrent risk factors for renal damage. Patients with renal insufficiency should stop metformin and have repeat lab tests for return to baseline renal function or show signs of clinical stability prior to restarting metformin.23 Metformin does not need to be stopped prior to contrast administration in patients with normal renal function and without other comorbidities.11,24 Stopping metformin and/or rechecking creatinine levels 48 hours after the procedure may be unnecessary, because the risk of contrast-induced nephropathy in patients with normal renal function without other comorbidities is very low. A recent study questions the widely held belief that contrast induces acute renal injury in patients with chronic renal insufficiency. The study concluded that no significant relationship exists between contrast administration and acute renal injury.29 Another study concluded no significant increased rates of acute renal injury after LOCM administration among critically ill patients.41 How much the impact of these results will change the practice of exercising caution in administering contrast to patients with decreased renal function remains to be seen. Patients with chronic kidney disease on dialysis may receive contrast. There is a theoretical risk of causing an oliguric patient anuric. For anuric patients, risks include causing fluid overload and pulmonary edema. Emergent dialysis is not needed unless patient shows signs of cardiopulmonary decompensation.11,42 Table 3 lists factors that need to be considered in a dialysis patient. Careful consideration of contrast reactions and contrast-induced nephrotoxicity among select patients will minimize complications related to contrast use. Use of iodinated contrast agents as part of radiologic examination is safe among most patient populations, including pregnant patients and breast-feeding mothers, and should be utilized when medically necessary. Hunt CH, Hartman RP, Hesley GK. Frequency and severity of adverse effects of iodinated and gadolinium contrast materials: Retrospective review of 456,930 doses. AJR Am J Roentgenol. 2009;193:1124-1127. McClennan BL. Ionic and nonionic iodinated contrast media: Evolution and strategies for use. AJR Am J Roentgenol. 1990;155(2):225-233. Lasser EC, Berry CC, Talner LB, et al. Pretreatment with corticosteroids to alleviate reactions to intravenous contrast material. N Engl J Med. 1987;317(14):845-849. Seong JM, Choi NK, Lee J, et al. Comparison of the safety of seven iodinated contrast media. J Korean Med Sci. 2013;28(12):1703-1710. Iyer RS, Schopp JG, Swanson JO, et al. Safety essentials: Acute reactions to iodinated contrast media. Can Assoc Radiol J. 2013;64(3):193-199. Pradubpongsa P, Dhana N, Jongjarearnprasert K, et al. Adverse reactions to iodinated contrast media: prevalence, risk factors and outcome-the results of a 3-year period. Asian Pac J Allergy Immunol. 2013;31(4):299-306. Kim MH, Lee SY, Lee SE, et al. Anaphylaxis to iodinated contrast media: Clinical characteristics related with development of anaphylactic shock. PLoS One. 2014;9(6):e100154. Gomi T, Nagamoto M, Hasegawa M, et al. Are there any differences in acute adverse reactions among five low-osmolar non-ionic iodinated contrast media? Eur Radiol. 2010;20(7):1631-1635. Schopp JG, Iyer RS, Wang CL, et al. Allergic reactions to iodinated contrast media: Premedication considerations for patients at risk. Emerg Radiol. 2013;20:299-306. Stacul F, van der Molen AJ, Reimer P, et al. Contrast induced nephropathy: Updated ESUR Contrast Media Safety Committee guidelines. Eur Radiol. 2011;21(12):2527-2541. American College of Radiology. American College of Radiology Manual on Contrast Media. 9th ed. Reston, Va; 2013. Greenberger PA, Meyers SN, Kramer BL, et al. Effects of beta-adrenergic and calcium antagonists on the development of anaphylactoid reactions from radiographic contrast media during cardiac angiography. J Allergy Clin Immunol. 1987;80(5):698-702. Namasivayam S, Kalra MK, Torres WE, et al. Adverse reactions to intravenous iodinated contrast media: A primer for radiologists. Emerg Radiol. 2006;12:210-215. Schabelman E, Witting M. The relationship of radiocontrast, iodine, and seafood allergies: A medical myth exposed. J Emerg Med. 2010; 39(5):701-707. Greenberger P, Patterson R, Kelly J, et al. Administration of radiographic contrast media in high-risk patients. Invest Radiol. 1980;15(6 Suppl):S40-S43. Shin MJ, Cho YJ. Management of adverse reaction to iodinated radiocontrast media. J Korean Med Assoc. 2012;55(8):779-790. Kim SH, Lee SH, Lee SM, et al. Outcomes of premedication for non-ionic radio-contrast media hypersensitivity reactions in Korea. Eur J Radiol. 2011;80(2):363-367. Kolbe AB, Hartman RP, Hoskin TL, et al. Premedication of patients for prior urticarial reaction to iodinated contrast medium. Abdom Imaging. 2014;39(2):432-437. Cochran ST. Anaphylactoid reactions to radiocontrast media. Curr Allergy Asthma Rep. 2005;5(1):28-31. Baig M, Farag A, Sajid J, et al. Shellfish allergy and relation to iodinated contrast media: United Kingdom survey. World J Cardiol. 2014;6(3):107-111. Bettmann MA. Frequently asked questions: Iodinated contrast agents. RadioGraphics. 2004;24:S3-S10. Morcos SK, Thomsen HS. Adverse reactions to iodinated contrast media. Eur Radiol. 2001;11:1267-1275. Thomsen HS, Morcos SK, Barrett BJ. Contrast-induced nephropathy: The wheel has turned 360 degrees. Acta Radiol. 2008;49(6):646-657. Andersen PE. Patient selection and preparation strategies for the use of contrast material in patients with chronic kidney disease. World J Radiol. 2012;4(6):253-257. Davenport MS, Khalatbari S, Dillman JR, et al. Contrast material-induced nephrotoxicity and intravenous low-osmolality iodinated contrast material. Radiology. 2013;267:94-105. Sandilands EA, Dhaun N, Dear JW, et al. Measurement of renal function in patients with chronic kidney disease. Br J Clin Pharmacol. 2013;76(4):504-515. Spanaus KS, Kollerits B, Ritz E, et al. Serum creatinine, cystatin C, and beta-trace protein in diagnostic staging and predicting progression of primary nondiabetic chronic kidney disease. Clin Chem. 2010;56(5):740-749. Dalton RN. Serum creatinine and glomerular filtration rate: perception and reality. Clin Chem. 2010;56(5):687-689. McDonald RJ, McDonald JS, Bida JP, et al. Intravenous contrast material-induced nephropathy: Causal or coincident phenomenon? Radiology. 2013;267:106-118. Moos SI, Stoker J, Nagan G, et al. Prediction of presence of kidney disease in a general patient population undergoing intravenous iodinated contrast enhanced computed tomography. Eur Radiol. 2014;24(6):1266-1275. Traub SJ, Kellum JA, Tang A, et al. Risk factors for radiocontrast nephropathy after emergency department contrast-enhanced computerized tomography. Acad Emerg Med. 2013;20(1):40-45. Keaney JJ, Hannon CM, Murray PT. Contrast-induced acute kidney injury: how much contrast is safe? Nephrol Dial Transplant. 2013;28(6):1376-1383. Davenport MS, Cohan RH, Khalatbari S, et al. 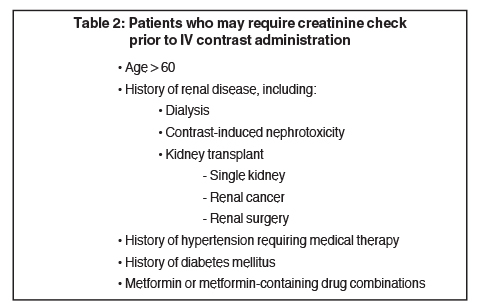 The challenges in assessing contrast-induced nephropathy: where are we now? AJR Am J Roentgenol. 2014;202(4):784-789. Stevens LA, Levey AS. Measured GFR as a confirmatory test for estimated GFR. J Am Soc Nephrol. 2009;20(11):2305-2313. Davenport MS, Khalatbari S, Cohan RH, et al. Contrast medium–induced nephrotoxicity risk assessment in adult inpatients: A comparison of serum creatinine level- and estimated glomerular filtration rate-based screening methods. Radiology. 2013;269:92-100. Geenen RW, Kingma HJ, van der Molen AJ. Contrast-induced nephropathy: Pharmacology, pathophysiology and prevention. Insights Imaging. 2013;4(6):811-820. Briguori C, Condorelli G. Hydration in contrast-induced acute kidney injury. Lancet. 2014;383(9931):1786-1788. Brar SS, Aharonian V, Mansukhani P, et al. Haemodynamic-guided fluid administration for the prevention of contrast-induced acute kidney injury: The POSEIDON randomised controlled trial. Lancet. 2014;383(9931):1814-1823. Hoffmann U, Fischereder M, Krüger B, et al. The value of N-acetylcysteine in the prevention of radiocontrast agent-induced nephropathy seems questionable. J Am Soc Nephrol. 2004;15(2):407-410. Poletti PA, Saudan P, Platon A, et al. I.v. N-acetylcysteine and emergency CT: use of serum creatinine and cystatin C as markers of radiocontrast nephrotoxicity. AJR Am J Roentgenol. 2007;189(3):687-692. Ehrmann S, Badin J, Savath L, et al. Acute kidney injury in the critically ill: Is iodinated contrast medium really harmful? Crit Care Med. 2013;41(4):1017-1026. Younathan CM, Kaude JV, Cook MD, et al. Dialysis is not indicated immediately after administration of nonionic contrast agents in patients with end-stage renal disease treated by maintenance dialysis. AJR Am J Roentgenol. 1994;163(4):969-971. Rajaram S, Exley CE, Fairlie F, et al. Effect of antenatal iodinated contrast agent on neonatal thyroid function. Br J Radiol. 2012;85(1015):e238-242. Bourjeily G, Chalhoub M, Phornphutkul C, et al. Neonatal thyroid function: effect of a single exposure to iodinated contrast medium in utero. Radiology. 2010;256(3):744-750. Webb JA, Thomsen HS, Morcos SK, et al. The use of iodinated and gadolinium contrast media during pregnancy and lactation. Eur Radiol. 2005; 15(6):1234-1240. Belzunegui T, Louis CJ, Torrededia L, et al. Extravasation of radiographic contrast material and compartment syndrome in the hand: A case report. Scand J Trauma Resusc Emerg Med. 2011;19:9. Sbitany H, Koltz PF, Mays C, et al. CT contrast extravasation in the upper extremity: Strategies for management. Int J Surg. 2010;8(5):384-386. Selek H, Ozer H, Aygencel G, et al. Compartment syndrome in the hand due to extravasation of contrast material. Arch Orthop Trauma Surg. 2007;127(6):425-427. Tonolini M, Campari A, Bianco R. Extravasation of radiographic contrast media: Prevention, diagnosis, and treatment. Curr Probl Diagn Radiol. 2012;41(2):52-55. Wang CL, Cohan RH, Ellis JH, et al. Frequency, management, and outcome of extravasation of nonionic iodinated contrast medium in 69,657 intravenous injections. Radiology. 2007;243(1):80-87. Practicing safe use of nonionic, low-osmolarity iodinated contrast. Appl Radiol. Dr. Roh is a Radiologist and Dr. Laroia is a Clinical Associate Professor of Radiology at the University of Iowa Hospitals and Clinics, Iowa City, IA.